Ever have those busy mornings where time just seems to go too fast? I know it happens a lot at our house! Here’s 10 five minute hairstyles that might just save the day! As you might notice, most of these are done on long hair, but I’m guessing a lot would work for medium and maybe even some short cuts too! Enjoy! 1. Triple Twisted Ponytail. A few twists and you’ve got a gorgeous do for those days you didn’t wash your hair. 2. 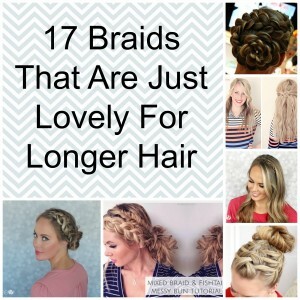 This rope braid is such a fun alternative to the regular braid! Love how easy it really is! 3. This fishtail braid is a favorite at our house. My daughter did this last weekend and it was just gorgeous! 4. This top knot tutorial breaks down the steps to the perfect bun! 5. This ponytail is perfect for a night on the town. 6. Just a few simple ingredients, and you’ve got some easy and gorgeous beach waves! 7. Such a fun go t0 summer hair. With video too! 8. This pulled back twisted braid hair style is the perfect style for a night out! 9. Style those pinned up bangs. Love this look! 10. Bubble Ponytail – this video tutorial will help your ponytail to go from plain and boring to amazing! Hope your mornings run just a bit smoother now! « Win New Summer Clothes from Piper Street!